Hello! I am the Quill Wielder. I have just joined The Dark Globe as one of its writers and I thought I’d start off my writing a bit about myself. My real name is Laura Pfundt. I’m a young writer from Melbourne, Australia. I’ve wanted to be a novelist since I was a young; I have draws and books full of story ideas. I’m first and foremost a fantasy writer. I love everything fantasy. I love creating new and strange worlds, name, creatures, people. There is nothing I can’t do with my imagination. I’ve written my first novel that is currently off at the publishers and am now working a children’s series. 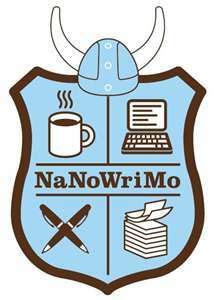 It’s funny I first heard about the NaNoWriMo maybe two or three weeks ago. At first I thought it sounded kind of interesting, I figured it was a good way to 1) Get yourself to Write 2) Get you used to dealing with a Deadline 3) Experience actually Writing a Novel 4) Get yourself to Actually Write that Novel you’ve always had in your head 5) A good Writer’s/Social Experience. However, as I had only returned to Writing in the Middle of August, after a 4 plus year unintentional hiatus, the idea of locking myself down to 1,666 Words A Day for 30 days (As the NaNoWriMo asks that you Write 50,000 in 30 Days (The Month of November)), seemed a bit, well, uncanny. However as the November 1st Starting Date has approached, I kept finding my mind wandering back to it. About a Week Ago, I decided to figure out how many Words on Average I had been Writing during the Month of October, as I had been quite busy with my other Two Blogs, The Written Word, and One Knight. I came to determine that I had been Averaging over 1,100 Words a Day. Hmm, not too far off from that 1,666. However, that might mean that The Written Word Post’s might suffer, especially my Blog Series, which I Write on a Very Regular Basis. Granted, I’m sure I would need breaks from Writing a Novel, and might Welcome a change in pace by Posting one of my Series Piece’s. However, just how fried would I be undertaking something like a Novel in 30 Days? So I’ve continued to just let it brew in the back of my mind, and during that brewing time I actually came up with a New Novel Idea. One that I would very much like to Write. I considered working on One Knight, my Childhood Novel that I’ve started over on the One Knight Site. As the Rules for NaNoMoWri would allow for me to work on a Novel I’ve already started, however they would ask that you only submit the words that you have actually written during the Month of November. Thus I wouldn’t submit the work I’ve already done when I submitted for Word Count. But if I decide, or had decided to do it, I think I would/would have started this Whole New Novel that I have in mind. That all said, I don’t believe I’m going to give it a go this year… As I’ve only just returned to Writing, and though I have been Writing a lot, I’m not sure I want to put myself under such constraints at the moment. I’m truly enjoying the Variety of Work I’m doing over on The Written Word, as well as my efforts on my One Knight Novel. Either way, I’d love to hear what you know, and/or if you are partaking in this Novel Writing Extravaganza. Yes, believe it or not, DarkJade has created a Third Blog. No, I’m not nuts… And no, I don’t have endless, upon endless, upon endless… Upon endless. Okay, maybe I do have more time than most to spend on Writing. My reason for Creating this yet Third Blog is, to Create a Space for us Writers/Artists to Blend and Mix our Talents, Experiences, Lives and… You get the point. 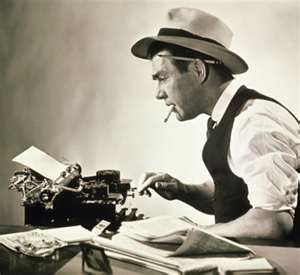 I’ve always been in love with the Image of the “News Man”, like in this Picture. Yes, I am a Romantic, and yes, I am a Film Buff… But it’s more than that. Often in Film’s he, or she as it were, is depicted as an Endless Enthusiasm, attached to the notion of getting the World out to the… Well… World. Yes, sometimes in Film’s, he’s also a Creep. I shall do my best not to be a Creep, lol. Though The Dark Globe isn’t designed to be a “News” site specifically, I am hoping that in it’s mix of Writing, it does capture the essence of what it is to be an Earthling in this Current World, as well as a means to bring forth some darn/damn good Writing. I hope you Enjoy, The Dark Globe.